Understand BI Business Intelligence using example ? BI stands for Business Intelligence. It is a process of converting data in to information. For example below is a sample customer data. Now when someone looks at the below data it probably does not make sense. But the time we analyze it and say “Majority of Customers buy toys” it starts making lot of sense. That small sentence above is nothing but information. That information will help your forecast and analyze how you would like to move ahead. .
BI is a general term, it is a concept. To implement this concept various organization like oracle, Microsoft have come up with various tools. This article will focus on Microsoft way of doing BI. So that word MSBI stands for (Microsoft Business Intelligence). 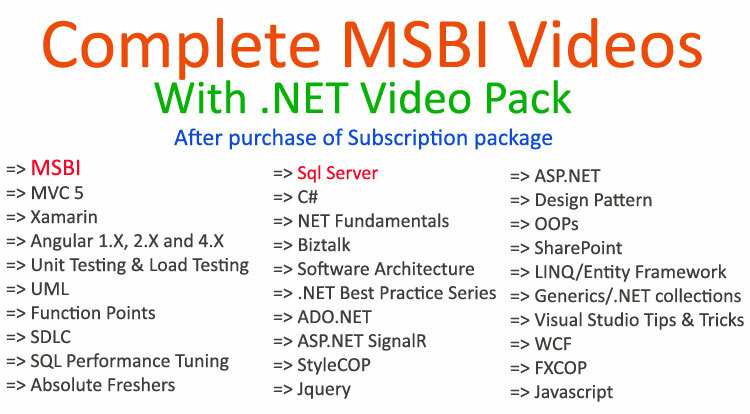 As we have understood about MSBI so now let us try to look into the details of MSBI. It is a composite of three separate entities . In this article we will be concentrating on SSIS (SQL Server Integration Services) and will create a simple project with SSIS. Before we proceed with creation of SSIS project let us first quickly go through about theory of SSIS. SSIS(SQL Server Integration Service): Under SSIS, raw data or raw information is taken from CSV form, excel or Microsoft access and stored in Dataware house. SSIS takes care of raw data (data source) and stores it in Dataware house which is not very easy it has to go through ETL(Extraction, Transformation and Loading) process. (1) Extraction from raw data is done it first identifies whether raw data is CSV file, binary, SQL file or Microsoft Access. Once the identification of data source is done then it’s Transformation is done. (2) In the Transformation process various data type used in raw data are brought into common data form in order to avoid confusion. (3) Once the Extraction and Transformation process is done then loading of that data source is done into DataWare house. What is the life cycle of BI? As we said previously BI converting data in to information. Converting data in to information is a complex process. It involves lot of steps let us understand the same. It takes raw data then it will do extraction in order to know which type of raw data it is whether CSV, binary format, SQL file and Microsoft Access file. Once type of the data is identified then it is transformed into common data form through extraction process. After successful transformation then loading of the data into dataware house. Data after reaching dataware house data’s analysis is done and then stored in data structure called CUBE. Finally massaged stored data is ready for displaying to the user as useful information through reporting. Copyright Â© 2017 learn MSBI Tutorials. All Rights Reserved.